Jessica Graf and Cody Nickson were crowned the winners of The Amazing Race's 30th season on CBS. The "Dating Couple" on the show -- who got engaged while the season was airing -- won the $1 million grand prize after they traveled more than 29,000 miles through nine countries and crossed the finish line in San Francisco, CA, in first place. "Dating Couple and Yale Debating Teammates" Henry Zhang and Evan Lynyak finished in second place. "Retired Professional Skiers and Friends" Kristi Leskinen and Jen Hudak placed third. And "Friends and IndyCar Drivers" Alex Rossi and Conor Daly placed fourth. Cody appeared shocked and stunned by his team's victory, and he was thankful Jessica was able to complete the final plane-building task of the entire race by herself before the other two teams. On her way to the finish line, Jessica cried tears of joy. During an exclusive interview with Reality TV World that took place after the finale, Jessica and Cody talked about their The Amazing Race victory as well as their love life. Below is the concluding portion of what they had to say. Reality TV World: Jessica, when did you get to meet Cody's daughter, Paisley? Jessica Graf: Pretty much right after The Amazing Race, and it was incredible! She took to me right away. I was holding her the entire night; she was in my arms the entire night. She's amazing. Cody Nickson: She loves Jess. Reality TV World: I know you two just got engaged, but have you started envisioning your wedding yet? Maybe you have a time of year or location picked out already? Cody Nickson: Jessica had the place picked out when she met me! Jessica Graf: I think we're going to get married in the fall ideally. We're in the middle of looking for a wedding planner right now, and we're going to do it when we're in Los Angeles. Reality TV World: Will it be next year? Reality TV World: That's awesome. Do you think any Racers from this season will be invited? I'm assuming no one from the Big Brother cast will be going... (laughs). Cody Nickson: You made a good assumption there! Obviously X Games [Kristi and Jen] maybe. Jessica Graf: Yeah, they'll definitely be there. We've become really great friends. Cody Nickson: To tell you the truth, we were talking with Eric Guiffreda -- one of the twins -- for a while too. The twins, both of them are Marines, so we had that in common on the Race. Reality TV World: A running joke throughout the season was Jessica calling Cody a "cyborg." Cody, was there any type of challenge or task that actually intimidated you this season -- or one you were thankful you didn't have to attempt at all? And did you have to make a concerted effort to be patient with Jessica and not push her too hard? 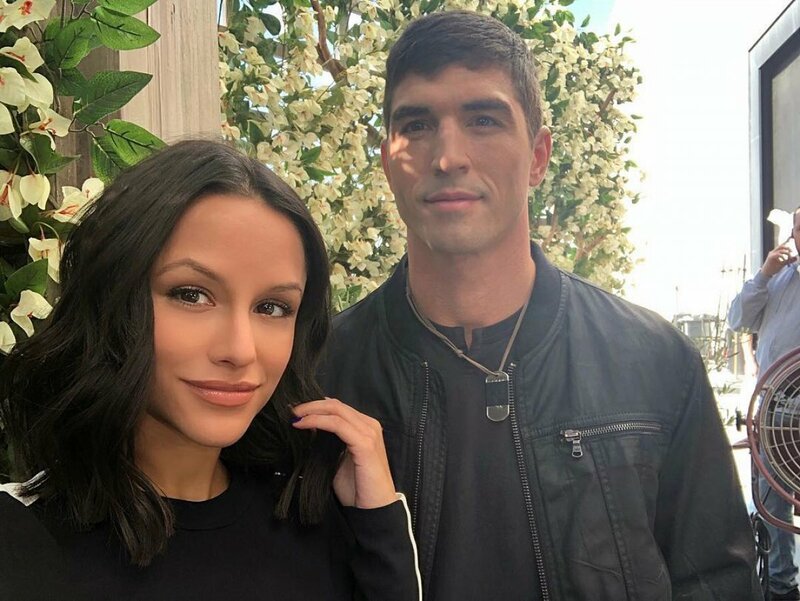 Cody Nickson: I'm not afraid of heights, I guess, but Jessica is fearless when it comes to heights, like absolutely -- they just don't bother her at all. Aside from that last challenge that I did, most height-related challenges, we made sure that Jessica did them. She just breezed through them no problem. Jessica Graf: Oh my gosh. You know, I never really thought there would be challenges like that. I was like, "This isn't Fear Factor; I don't have to worry about creepy, crawly things." I was wrong. Reality TV World: Jessica, you've received some criticism throughout the Race season for being a little hypocritical. For instance, you would U-Turn a team but then get mad when [Lucas Bocanegra and Brittany Austin] U-Turned you. And then there was the situation with Brittany's Travelocity gnome, but you later got angry with Evan for not helping you at a Detour. So I want to just give you a chance to respond. Do you still feel your frustrations were justified? Jessica Graf: I think anybody who thinks I was being hypocritical wasn't paying attention. They probably have the show on in the background and weren't paying attention to details, because when it came down to being U-Turned, we had to U-Turn Well Strung [Trevor Wadleigh and Chris Marchant]. I actually really loved Well Strung; I thought that they were amazing, amazing guys. And we were second to last at that point, and we did it to survive. Cody Nickson: Until we watched the show. Jessica Graf: Until we watched the show. I had no idea that my name was pouring out of her mouth in every single episode -- no clue. She continuously made passive aggressive comments in group settings throughout filming, and I never once did anything to her. So she had kind of created this storyline that I had no idea was going on. And then once they U-Turned us, it was personal. You don't have to U-Turn a team that's in last place unless you have something against them. And she really thought that we were coming after them because she built it up in her mind that way. And as far as the Travelocity gnome goes, what you don't see in the show is that Brittany and I were helping each other on that Roadblock probably for a good hour and a half because we were both lost. It wasn't until we reached the payphone that she decided not to say a word to me and just run off. She made the decision at that point that we were no longer working together. And I had no obligation to someone who decided to leave me behind to grab her gnome and run with her. So, Brittany I think is a completely delusional human and she created this storyline and anyone who thinks I'm hypocritical should go back and watch the season. Jessica Graf: She just likes to blame everything that goes wrong in her life on me. So, I mean, if that's making her sleep better at night, then I'm glad I could be her relief. Cody Nickson: I did see a clip though where Jessica ripped Brittany's passport out of her bag. Jessica Graf: Yeah. I totally stole her passport too. I'm sure she blames me for that as well. Cody Nickson: Just kidding! Just kidding. Reality TV World: If you two had arrived at the U-Turn board in first place earlier in the season, which team would you have picked to U-Turn and why? Part of the reason I'm asking is I was surprised Alex and Conor selected Henry and Evan when the professional skiers were still in it. You'd think Kristi and Jen would be the better strategic choice, no? Cody Nickson: No, no, no. Us, X Games and Indy had all talked about it. If we got to the U-Turn board and could help each other, we were going to U-Turn Yale. So we all had it in our minds that we were going to U-Turn Yale. And they were a strong team. I know we didn't say it much during the Race, but they were rocking and rolling. Reality TV World: For the "Partner Swap" twist earlier in the season, Cody, you didn't hesitate at all when teaming up with Kristi and Jen. Why them instead of Alex and Conor? And what did you learn to appreciate about each other after racing a leg apart with other people? Cody Nickson: Kristi and Jen were the better team, simple as that. And it brought us closer as friends. [We learned] that Jessica and my strengths and weaknesses definitely complement each other. She's the foundation for my strength as you can see multiple times throughout the Race. I was strong on certain things, but it was because Jessica was there to keep me strong. You saw that singing challenge. I was pissed! Reality TV World: So what's next for you both? What does the near future hold? Jessica Graf: (Laughs) A wedding and babies! Reality TV World: How many kids would you like to have? To read the first half of Reality TV World's exclusive The Amazing Race interview with Jessica and Cody, click here.